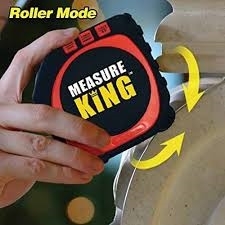 Measure King is the 3 in 1 digital measuring tape that can measure any and all surfaces! This measuring tape is the new and easy way to measure faster and more effectively. 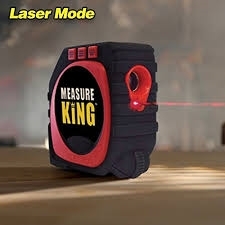 Measure King has 3 measuring modes for easy use. Roll Mode will measure any curved surface or irregular shaped object just by rolling the attached wheel for length or distance. 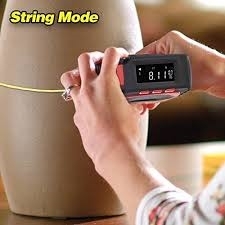 Flex Cord (String Mode) allows you to easily measure anything rounded. And Laser Mode is for those long and hard to reach areas. Just point and measure! 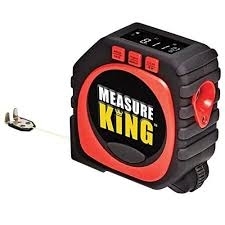 Measure King is so accurate with its measuring capabilities it can measure accurately up to 1/100th of an inch!! And it comes with a convenient Large back lit LED display for easy reading.